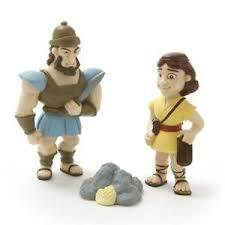 Full color figures for children age 3 and older include David, Goliath and a collection of 5 smooth stones, from Tales of Glory. For interactive playtime fun and learning about a great Bible story. Child-safe PVC figures fit conveniently into the hands of small children, without sharp edges. 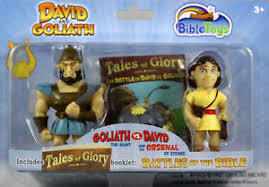 Includes mini story book entitled "David and Goliath"; packed in see-through blister box, for Sunday School lessons, and for biblical Bible storytelling. Figures are approximately 3" tall.